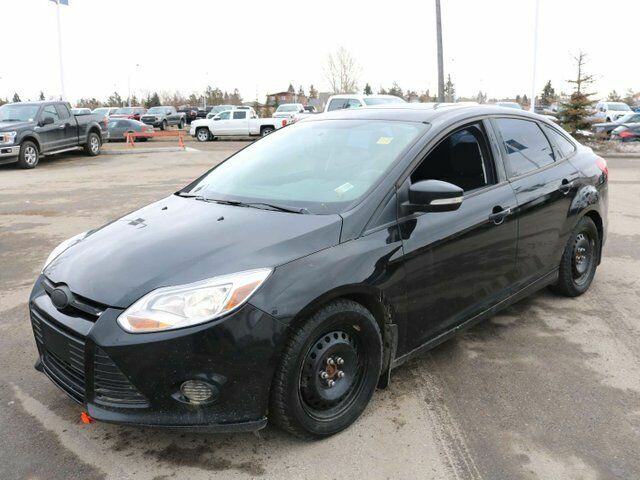 Excite all of your senses with our 2014 Ford Focus SE Sedan on display in Tuxedo Black. Powered by a 2.0 Litre 4 Cylinder that offers 160hp while connected to a smooth-shifting 6 Speed Automatic transmission. This Front Wheel Drive combination offers near 6.5 L/100km and with fewer trips to the gas pump, you will have more time and money for the good things in life! Driving the Focus SE is pure enjoyment when you have amenities such as Ford Sync onboard. Voice-activated phone and stereo controls ensure your hands are on the wheel and eyes on the road. Combine the superb six-speaker stereo system, comfortable heated front seats, power windows and locks, tilt and telescoping steering wheel, a handy front center storage console, and you are riding in style. Ford always strives to make your ride one of the safest on the road and once again they stepped up to the plate providing six standard airbags, electronic stability control, anti-lock brakes, and tire pressure monitoring that all ensure the safest ride possible. It's no surprise the 2014 Ford Focus earned five stars on the national safety ratings. MyKey technology allows parents to designate a key that will operate unique features such as speed and audio volume to ensure safe teen driving. You can't go wrong with a Ford Focus! Print this page and call us Now... We Know You Will Enjoy Your Test Drive Towards Ownership! AMVIC Licensed Dealer.